Let's see those effects! I'm in the early stages of building my board so not much to show here, just an Ernie Ball Volume Pedal and a Sadowsky D.I. (which aren't even effects lol!). Humphreys Audio Modded Badder Bass Monkey Tube Bass Overdrive- cool 'cranked' tube a,p sounding OD with ZERO bass loss!!!! Behringer-BDDI21 DI OD.-been working & saving the day when DI's needed for 4 yrs so far! Yeah I know-well thought as much. Just- I'm a groundsman at a govt School & so aint "meant' to be 'on' the computer........ so I'll get around to it Then I'll edit my posts!! I do have Digitech bass drive but theres no real point for it seeing the Soda Meiser and OS can both do fuzz, I do want to try a blend with the Soda Meiser too. fender J bass> Ibanez Weeping Demon> MXR Dynacomp> Guyatone Bottom Limiter> Line6 Ubermetal> Ashdown amp. every block fits. every black minute. 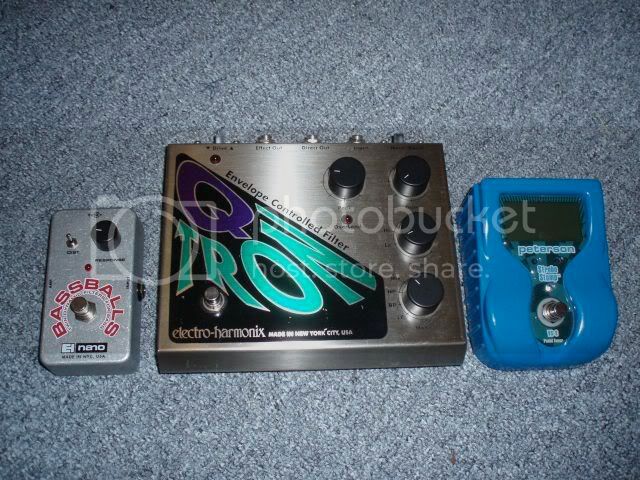 I previously had a Crybaby 105Q (the white one) but I ended up mainly using it like an envelope filter, so sold it and got the Q-Tron a bit later down the track instead. My new board is a work in progress, and my old board has been disassembled. That's a dillema many of us have faced. Some people are happy not to have their effects going to FOH. Ultimately a box such as the Sadowsky is either a DI box or a preamp, not both. Pick one and buy something else to do the other job! Others like the EBS MicroBass have an effects loop so you can supposedly have your cake and eat it, but I've never found an effects loop that I like the sound of and the MicroBass's loop is no exception. Been rejigging my board, so no pic as yet. Waiting for a footswitch to arrive before I attach everything to the board. I don't have much need for chorus, phaser, flanger, delay or octaver, so for those rare occasions the ME-20B is adequate for my needs, plus I can use it's tuner and volume pedal in the chain as well, to save space on the pedal board. Yeah, I'm thinking of just using it at the start of my chain (before effects) and use the D.I. on my amp. The Sadowsky sounds so damn good as a preamp, I'll probably leave it on all the time. It'll give me a fatter signal for the effects that way. niftydog wrote: My new board is a work in progress, and my old board has been disassembled. fender highway 1 jazz->american big muff -> agent 00Funk -> hartke A100 combo amp.